French Jesuit. He wanted to enter the priesthood from an early age, but his health was so bad there were doubts he could make it. His posting as a missionary to frontier Canada at age 32, however, was a literal god-send. He spent the rest of his life there, and the harsh and hearty climate so agreed with him that the Natives, surprised at his endurance, called him Echon, which meant load bearer, and his massive size made them think twice about sharing a canoe with him for fear it would sink. Brebeuf had great difficulty learning the Huron language. "You may have been a famous professor or theologian in France," he wrote in a letter home, "but here you will merely be a student, and with what teachers! The Huron language will be your Aristla crosse." However, he eventually wrote a catechism in Huron, and a French-Huron dictionary for use by other missionaries. According to histories of the game, it was John de Brebeuf who named the present day version of the Indian game lacrosse because the stick used reminded him of a bishop's crosier (la crosse). 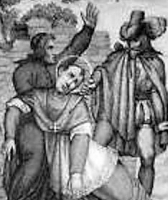 Saint John was martyred in 1649, tortured to death by the Iroquois. By 1650 the Huron nation was exterminated, and the laboriously built mission was abandoned. But it proved to be "one of the triumphant failures that are commonplace in the Church's history." These martyrdoms created a wave of vocations and missionary fervor in France, and it gave new heart to the missionaries in New France. Brebeuf's Instructions to the Missionaries: In 1637, Father Brebeuf drew up a list of instructions for Jesuit missionaries destined to work among the Huron. They reflect his own experience, and a genuine sensitivity toward the native people. • You must love these Hurons, ransomed by the blood of the Son of God, as brothers. • You must never keep the Indians waiting at the time of embarking. • Carry a tinder-box or a piece of burning-glass, or both, to make fire for them during the day for smoking, and in the evening when it is necessary to camp; these little services win their hearts. • Try to eat the little food they offer you, and eat all you can, for you may not eat again for hours. • Eat as soon as day breaks, for Indians when on the road, eat only at the rising and the setting of the sun. • Be prompt in embarking and disembarking and do not carry any water or sand into the canoe. • Be the least troublesome to the Indians. • Do not ask many questions; silence is golden. • Bear with their imperfections, and you must try always to appear cheerful. • Carry with you a half-gross of awls, two or three dozen little folding knives, and some plain and fancy beads with which to buy fish or other commodities from the nations you meet, in order to feast your Indian companions, and be sure to tell them from the outset that here is something with which to buy fish. • Always carry something during the portages. • Do not be ceremonious with the Indians. • Do not begin to paddle unless you intend always to paddle. • The Indians will keep later that opinion of you which they have formed during the trip. • Always show any other Indians you meet on the way a cheerful face and show that you readily accept the fatigues of the journey. Son of Duke Hugo of Worms, Germany. Educated at the cathedral school at Worms. Provost of the cathedral. Ordained in 994. Chancellor for Italy under King Otto III in 994. Chancellor for Germany in 997. Archbishop of Cologne, Germany on 9 July 999. Attended the death-bed of King Otto at Paterno. Initially opposed the ascension of King Henry II, and was imprisoned by him. However, when Henry was elected king on 7 June 1002, Heribert immediately acknowledged him as king, and became one of his advisors. Founded and endowed the Benedictine monastery and church of Deutz, Germany. Obtained miracles by prayer, including the end of a drought. Honoured as a saint even during his lifetime. Eldest daughter of Saint Adalbald of Ostrevant and Saint Rictrudis of Marchiennes; great-granddaughter of Saint Gertrude the Elder; sister of Saint Maurontius, Saint Clotsindis, and Saint Adalsindis of Hamay. After her father's murder when she was very young, she was sent to the abbey of Hamage, Doudi, France, which her great-grandmother had founded and served as abbess. Gertrude died when Eusebia was twelve years old; the young girl was elected to replace her. Rictrudis, realizing her daughter had no hope of governing the abbey, but wanting to keep it under the protection of a noble house, merged Hamage with her own house of Marchiennes, and ordered all the sisters to move in together under her rule. Many of the uprooted sisters, including Eusebia, were unhappy with this order as it kept them from obeying Saint Gertrude's last request. After much time and debate, the dissident sisters were permitted to return to their old house, taking Gertrude's relics with them, and taking Eusebia as their abbess. The delay had allowed her to grow into the position, and she proved an excellent abbess. Benedictine monk at the abbey of Saint Lawrence in Cremona, Italy. Abbot in 1155. Sided with the Pope against Emperor Frederick Barbarossa, and so was banished from the abbey by the emperor. Hermit near Mantua, Italy. Bishop of Mantua in 1174, replacing a bishop removed for transgressions in office. In 1177, his predecessor repented, returned, and requested the return of his see. John asked permission to resign, return the mitre to the previous bishop, and return to his life as a hermit. The request was granted, and John transferred to Vicenza, Italy. John was murdered by a man who had embezzled Church funds, and whom John was reprimanding. As John died working for the Church, and correcting a sinner, he is considered a martyr. Prominent citizen of senatorial rank. Arrested for his faith during the persecutions of Diocletian, he was tortured then put on display for abuse for a year in cities all over Cilicia, being led around behind a camel. Martyr. Praised by Saint John Chrysostom in a homily during the enshrinement of his relics. Disciple of Saint Columba. Founded a church and monastery at Innisfallen, Ireland. Monk at Clonmore, Ireland. Abbot of Swords abbey near Dublin, Ireland. In his later years he retired to Clonmore to spend his last days as a prayerful monk. He was called Lobhar (the Leper) because he briefly contracted leprosy when he miraculously cured a young boy of the disease. Married layman cloth merchant in Wakefield, England. Father of several children. A widower, he divided his property among his children, and studied for the priesthood in Rheims, France. Ordained in 1581. He returned to England as a home missioner to covert Catholics. Arrested at the home of a Mr Murton in Lancashire for the crime of priesthood. Martyred with Blessed Robert Dalby. Son of Saint Vincent Madelgarus and Saint Waldetrudis; brother of Saint Landric, Saint Madalbarta and Saint Aldetrudis. Nephew of Saint Aldegund. An extraordinarily pious child, he is considered a confessor of the faith. A church in Cleves, Germany, was named for him. Contemporary of Saint Patrick. Founded Kill-Abban abbey in Leinster, Ireland, and served as its first abbot. Founded the convent for Saint Gobnait of Ballyvourney, Ireland. Benedictine monk at the monastery of Fritzlar, Germany, in 738. Teacher at the abbey school. Abbot at Fritzlar. Bishop of Würzburg, Germany in February 754. In 769 he retired to Neustadt abbey to spend his last days as a prayerful monk. Protestant minister. Convert to Catholicism. Studied in Douai and Rheims in France. Ordained in 1588, he returned to England to minister to covert Catholics. Arrested for the crime of priesthood in 1589, he was martyred with Blessed John Amias. After a wild and misspent youth, Torello lived 60 years as a hermit in a walled-up cave. Vallombrosan oblate. Bishop of Aquileia, Italy. His prayers would cause the collapse of pagan temples and idols. Martyred in the persecutions of Numerian by order of the prefect Beronius. Mercedarian friar. Priest. Bishop of Lugo, Spain. Royal chaplain to the court of Castile. Claretian priest. Martyred in the Spanish Civil War. Armenian monk. Bishop of Nicopolis, Armenia. Became a hermit at Pithiviers, Orleans, France. Deacon in Aquileia, Italy. Martyred in the persecutions of Numerian. The details of this person's life have been lost. Layman in Aquileia, Italy. Martyred in the persecutions of Emperor Numerian. Poor Clare nun. Succeeded Saint Clare of Assisi as abbess of Saint Damian's abbey at Assisi, Italy. Christian lay man in Aquileia, Italy. Martyred in the persecutions of Numerian. Layman in Aquileia, Italy. Martyred in the persecutions of Numerian. Fourth century bishop of Ravenna, Italy. Benedictine nun. Anchoress at Asti, Italy. Hermit and miracle worker in Syria.